I'm not a fan of "climbers" on a school yard playground. I have no issue with them on "destination" playgrounds, places where children tend to play for an hour or two, once in awhile, but when it comes to a place where the same kids convene day-after-day, I've come to see them as wastes of both money and space. 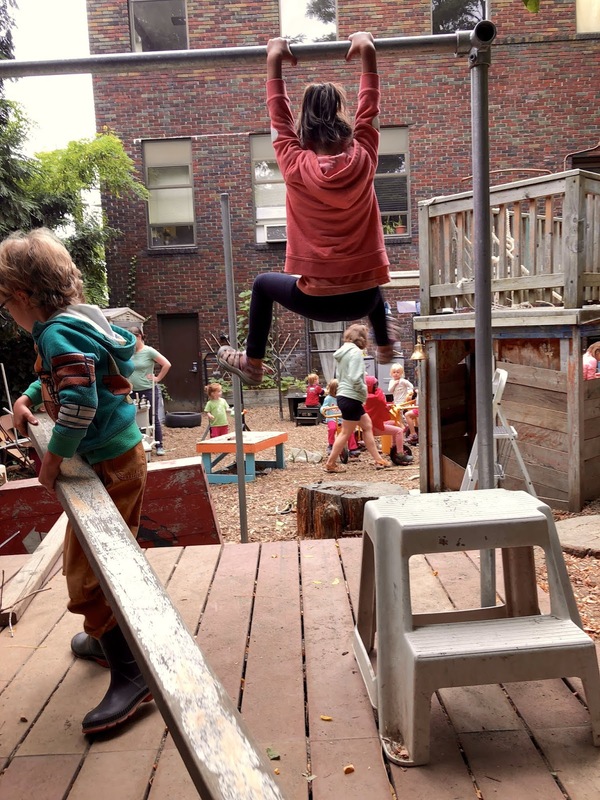 The problem is that these out-of-the-box constructions, no matter how elaborate, no matter how many slides or poles or ladders, have a finite amount of play-value for most children. Yes, they scramble all over them for a day or for even weeks, but eventually the kids play the risk (or the fun) right out of them. From there they tend to either seek ways to make them more risky (or fun) again, which typically involves doing hazardous things like climbing on the "outside" or the "top," resulting in adult scolding and rule-making, or they just abandon the apparatus altogether. That's what happened with our last foray into the world of climbers. 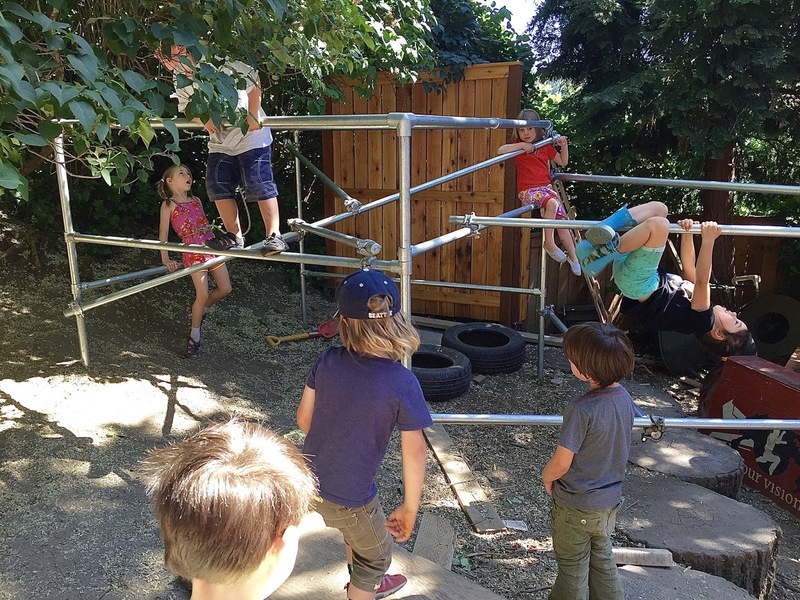 We had never had one for all the aforementioned reasons, but a couple years ago, one of students was taking parkour classes and his mother wanted to install a parkour style climber on our playground. 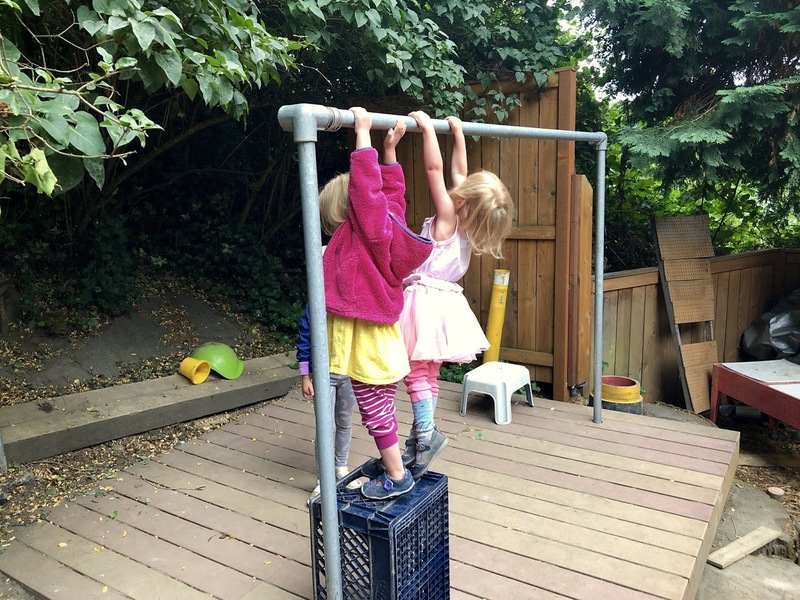 She assured me that this would be different because it wasn't out-of-the-box, that it was adjustable, that the bars could be moved around, even installed at angles, and that she would not be offended if we later decided to remove it. Not only that, but she was willing pay for it, all of which added up to us designating a corner of the playground for its installation. I'll admit, I was impressed. 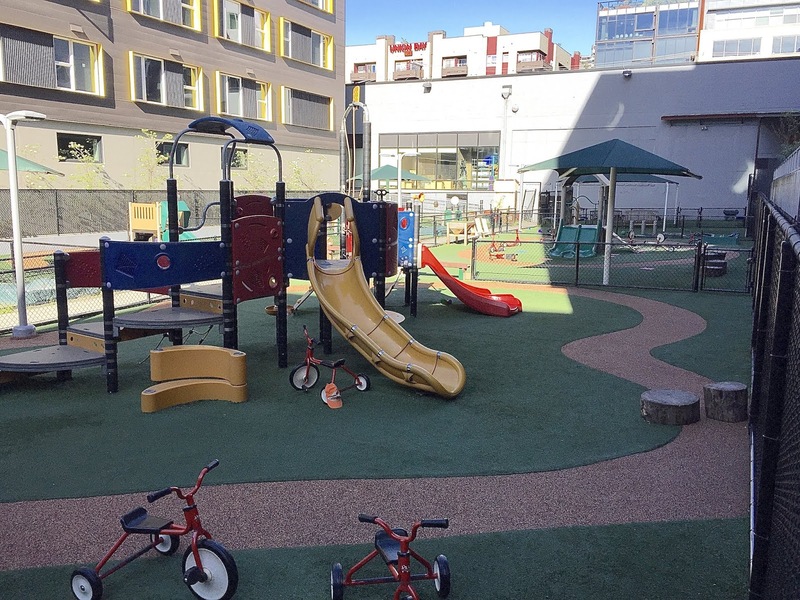 It did seem to be special and the kids did play with it in throngs, but sure enough, their numbers dwindled until we were going weeks at a time without a single child venturing into the area. It's not that they weren't climbing on stuff -- they were up and down trees, using our ladders, building their own contraptions with boards and shipping pallets -- they just weren't climbing on the official climber. Our space is limited, so after about a year, we replaced it with a "stage," a simple flat platform that gets used every single day. We didn't, however, remove the five upright poles, the parts that were installed with concrete footings, instead building the stage round them. We also left one horizontal bar across what I was thinking of as the front of the stage, a place from which I envisioned us hanging curtains, you know, like a real stage. The kids never cared for the curtain idea, but those poles, the five vertical ones and the single horizontal one seem to be in use pretty much all day long, every day. Indeed, there is always someone hanging from the horizontal bar, swinging from it, moving across it hand-over-hand. 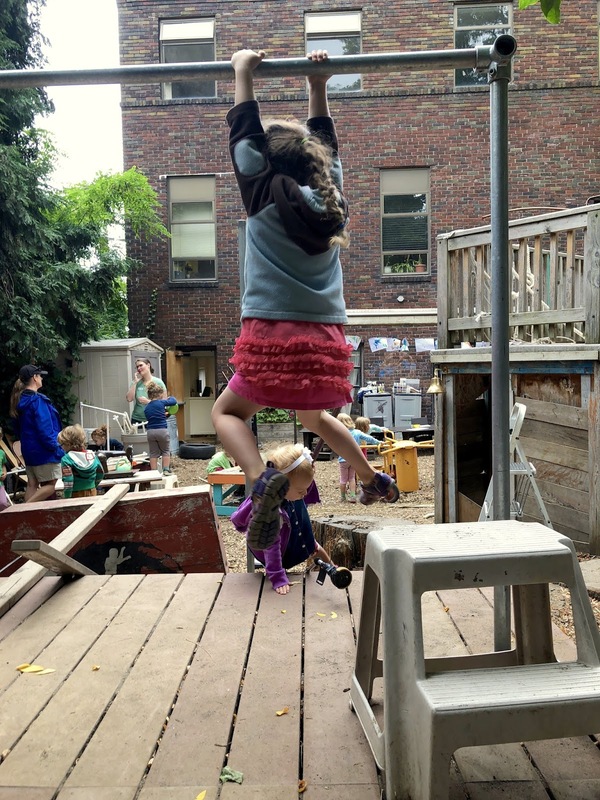 Sometimes there are so many kids wanting to use it that they are forced to organize themselves for turn-taking. This has been going on for the better part of two years, which surprises me. I mean, one would expect that by now the risk (or fun) would have been played out of those bars, but somehow it's not happening. I imagine it has something to do with the fact that it isn't a climber at all, that those poles, in fact, have no officially declared purpose whatsoever. They stand there rather as relics of the past, remains of a past "civilization," without a script other than that we create for them as we play. Unlike those out-of-the-box climbers with their pre-digested purpose, these poles exist without any meaning other than that with which we, for a time, imbue them. I think that's their attraction. "Why Doesn't She Share With Them?" "Are You A Boy Baby Or A Girl Baby?" It's Not Good Enough To Be "Just Fine"
"It's Really Easy To Fall Into The Trap"